And we're back at it with some more DPA mics; this time the 4099G guitar mic. The 4099 is based on the same basic capsule as the 4098H choir mics and the SMK4081. 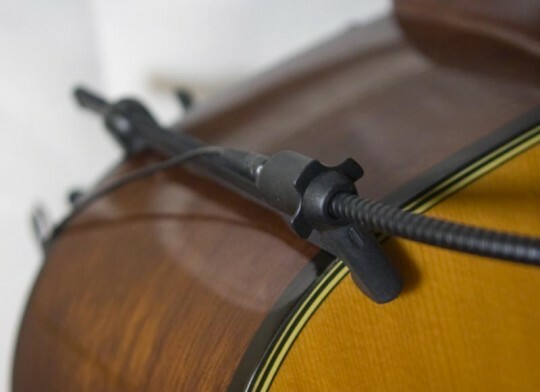 The 4099, however, comes in a shock mounted, flexible boom that attaches to a very clever guitar body mount. One end of the mount hooks over the front of the body of the guitar, and the other end clips on the back. The rear of the mount slides back and forth on a plastic i-beam. You slide it to a size slightly smaller than the depth of the guitar body, then press the tabs together. This opens it up just enough to fit over the body. Let go and it snugs right up. It's simple, clever and secure. This is the clever mount that secures the mic to the guitar body. The mic boom slides into a rubber socket, and a collar slides down over it to lock the two pieces together. It sounds a lot more complicated than it actually is, now that I'm writing it. It takes just a minute or so to get the mic positioned. Once it's locked in, you are able to flex the mic to just the right position. You can swing it out more over the sound hole, or higher up on the neck. It's easy to find a spot where it both sounds good and is out of the way of the player. The collar slips over the mount to secure it in place. Mounted, you now have lots of options. So the design is clever, how does it sound? In a word, great. Like every other DPA mic I've had the pleasure of using, this one sounds less like a mic and more like the instrument you are mic'ing. As with my piano mic test, I recruited our student ministries worship leader Luke Peach to play for me. He has a great-sounding Taylor with a built-in pickup. I used a Klark Technik DI for the pickup and recorded both the pickup and mic simultaneously through my M-Audio Fast Track Ultra. In the samples below, you'll get a sense of the differences between the two sounds. First up, here's a 60 second clip. I switched from the DPA to the pickup roughly at the 10 second marks. Some cuts are obvious, others are not. The DPA gets the odd 10s, the pickup the evens. So, it goes, DPA -> Pickup -> DPA -> Pickup ->DPA -> Pickup. The EQ on both is totally flat, it's exactly the way it came in to Reaper. Now, I would almost never run an acoustic guitar totally flat. You can hear in both samples (and it's a bit more pronounced with the DPA) the lower octave harmonics that color the sound somewhat unfavorably. So for the next few samples, I slid a high-pass filter with a hinge frequency of about 140 Hz in the chain. There are 4 samples, DPA, Pickup, DPA Pickup. It's the exact same piece of music in 1 & 2, and another one in 3 & 4. These clips are a little longer so you can hear them a little better. I really like the sound of this mic. With the high-pass in, it sounds clean and warm. More importantly, it sounds like Luke's guitar. The pickup, while good, seems to add a bit of unnecessary sparkle that makes the upper strings sound a touch harsh. 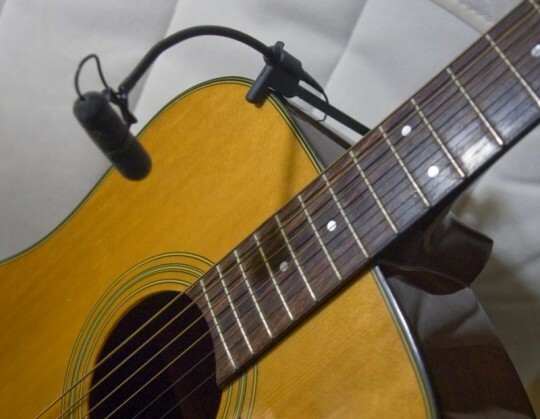 The downside of this mic (and any other mic on an acoustic guitar) is that it would pick up a lot of other stuff were it used in a live, full band setting. I don't think I would use it on a normal weekend when we have electric guitars, drums, bass, keys, B3 and sax on stage. The pickup would give much better isolation in that case. 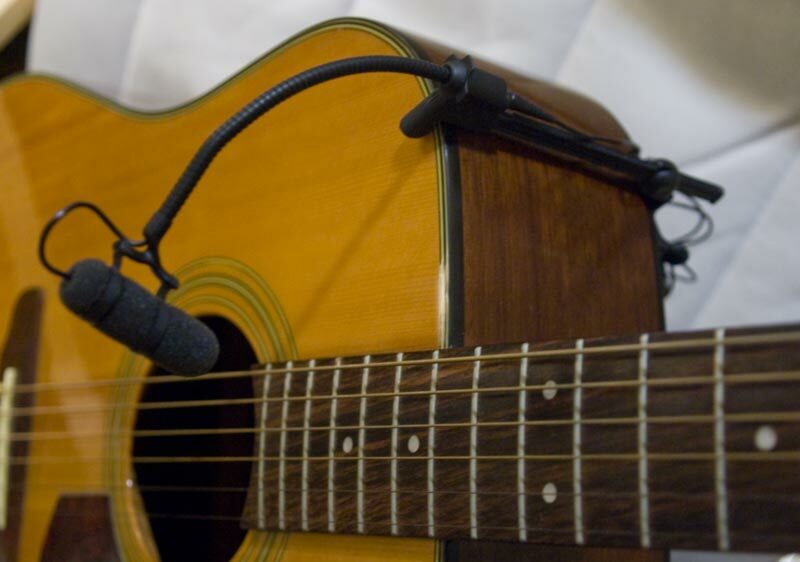 However, on an acoustic weekend, it would be real tempting to throw this mic on a guitar. In the time I've had with it, I prefer the sound of the 4099G to that of the pickup, the only real concern is isolation. In a studio, this would be a non-issue and I would use it in a heartbeat. The 4099G retails for about $599 and is available now. UPDATE: So it seems that for some reason, Firefox does not support the player that I'm using for the embedded audio samples. I'm not yet sure of the cause; however, using Safari or Chrome would be a good way to listen to the clips. I'll see what I can figure out with the player. Sorry for the inconvenience.